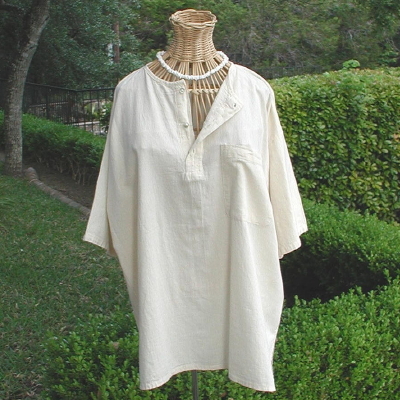 Natural organic soft cool Mexican cotton. What a perfect beach, patio, or picnic shirt! Thrown over a pair of jeans or Dockers, you can head for lunch with friends and look decidedly “tropical” and cool. 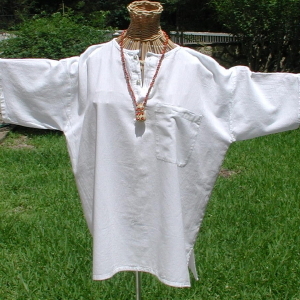 This shirt has no collar, goes on easily over the head, and has a pocket for that short shopping list on the way home. Bust 40" opens to 44"
Hips 42" opens to 44"
Hips 46" opens to 48"
Bust 48" opens to 52"
Hips 50" opens to 52"
Bust 54" opens to 58"
Hips 56" opens to 58"
Single items are shipped through USPO Priority Envelope for $ 6.45. Sometimes 2 items will fit into an envelope, or may go in a ZOne "A"
Priority box. 3 items go into a Medium Box for $ 13.45.